1984-05-02. New. Ships with Tracking Number! INTERNATIONAL WORLDWIDE Shipping available. Buy with confidence, excellent customer service! 1972-05-03. New. Ships with Tracking Number! INTERNATIONAL WORLDWIDE Shipping available. Buy with confidence, excellent customer service! Viking Adult. Hardcover. 0670681644 1st Edition, 3rd Printing 1972 Viking Publishing. Book is in like new condition and comes with a Mylar protective cover. Customer service is our #1 priority. We sell great books at great prices with super fast shipping and free tracking. . Fine. New York: The Viking Press, 1972. Unrevised proofs. 312 pp. 1 vols. 8vo. Yellow wrappers., with review slip affixed to front cover; fine. Unrevised proofs. 312 pp. 1 vols. 8vo. Easton Press, 2007-01-01. Leather Bound. New. NEW. Burgundy leather bound. Gold gilded edges. Gold foil embossed cover. Perfect inside and out. Easton Press copyright 1999. 1978-07-01. New. Ships with Tracking Number! INTERNATIONAL WORLDWIDE Shipping available. Buy with confidence, excellent customer service! 2004-02-08. New. Ships with Tracking Number! INTERNATIONAL WORLDWIDE Shipping available. Buy with confidence, excellent customer service! 1986-07-09. Good. Ships with Tracking Number! INTERNATIONAL WORLDWIDE Shipping available. May not contain Access Codes or Supplements. May be ex-library. Shipping & Handling by region. Buy with confidence, excellent customer service! 1978-07-01. Good. Ships with Tracking Number! INTERNATIONAL WORLDWIDE Shipping available. May not contain Access Codes or Supplements. May be ex-library. Shipping & Handling by region. Buy with confidence, excellent customer service! 1987-10-01. Good. Ships with Tracking Number! INTERNATIONAL WORLDWIDE Shipping available. May not contain Access Codes or Supplements. May be ex-library. Shipping & Handling by region. Buy with confidence, excellent customer service! 1984-05-02. Good. Ships with Tracking Number! INTERNATIONAL WORLDWIDE Shipping available. May not contain Access Codes or Supplements. May be ex-library. Shipping & Handling by region. Buy with confidence, excellent customer service! New York: Viking Press, 1972. First printing. Paperback. Fine. 8vo, 312 pages, tawny covers Unrevised Galley Proofs. Viking Adult, 1972-05-16. Hardcover. Used:Good. Ballantine Books, 1986-09-12. Mass Market Paperback. Used:Good. Bison Books. PAPERBACK. 0803259514 New Condition. . New. Viking Adult. Hardcover. 0670681644 New Condition. . New. Ballantine Books. MASS MARKET PAPERBACK. 0345309847 New Condition. . New. 1972-05-03. Good. Ships with Tracking Number! INTERNATIONAL WORLDWIDE Shipping available. May not contain Access Codes or Supplements. May be ex-library. Shipping & Handling by region. Buy with confidence, excellent customer service! Viking Adult. Hardcover. 0670681644 Like New Condition. . Fine. 2004-02-08. Good. Ships with Tracking Number! INTERNATIONAL WORLDWIDE Shipping available. May not contain Access Codes or Supplements. May be ex-library. Shipping & Handling by region. Buy with confidence, excellent customer service! New York, New York: Ballantine Books, 1984 Book. Good +. Mass Market Paperback. First Edition. Good + mass market paperback. May be some rubbing, bumping and creasing to edges, corners and spine of book. Overall a good tight copy..
Ballantine Books. MASS MARKET PAPERBACK. 0345309847 Like New Condition. . Fine. Bison Books. PAPERBACK. 0803259514 Like New Condition. . Fine. Penguin Books, 1990-03-01. Paperback. Used:Good. Norwalk Connecticut: The Easton Press Book. Near Fine. Full-Leather. Bison Books, 2004-03-01. Paperback. Used:Good. Bison Books, March 2004. Paper Back Paper Back. New. Bison Books. PAPERBACK. 0803259514 Special order direct from the distributor . New. Viking Adult, 1972-05-16. Hardcover. Good. Paperback. New. 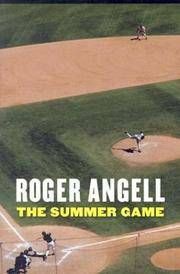 The Summer Game, Roger Angell's first book on the sport, changed baseball writing forever. Thoughtful, funny, appreciative of the elegance of the game and the passions invested by players and fans, it goes beyond the usual sports reporter's beat to examine baseball's complex place in the American psyche. Viking Adult. Hardcover. 0670681644 Condition: VERY GOOD. (Book may have one or a combination of the following characteristics: former library book, cover wear, name written inside cover, light underlining/highlighting, remainder mark, etc. Overall, the book is in solid shape. This is a blanket description. Please email us if you require a specific, detailed description of the book condition. We will typically respond within 24 hours). . Very Good. NY: VIKING, 1972 DJ EDGE WEAR. 3rd. Very Good/Good. Viking, 1972. Second printing. Slight sunning to edges, still fine in near fine, lightly toned dust jacket in mylar cover. Condition: Slight sunning to edges, still fine in near fine, lightly toned dust jacket in mylar cover. New York: Penguin Books, 1990. First Thus . Soft cover. As New. Trade Sized Paperback. First Printing Thus. Penguin Sports Library. With color illustrated cover. 303 pages. AS NEW. Not read. All corners sharp and binding tight, without stress marks and square. Without tears, creases, bumps or chips. Not marked in any way and very bright and clean. All books carefully wrapped and sent boxed. Penguin (Non-Classics), 1990-03-01. Paperback. Good. Viking, 1972. 303 pages, green paper with blue cloth binding, gilt ltrs on spine, green printers ink on top edges, corners bumped, tight. DJ is white pictorial with green/blue/& black ltrs with nicks and tears on edges and corners as well as scruffed. Baseball biography and sports.. 2nd Printing. Hard Cover. G++/G+. 8vo - over 7¾" - 9¾" tall. Bison Books. PAPERBACK. 0803259514 Brand New! No Remainder Marks or Worn Dirty Overstocks! . New. Viking, NY. 'Fifth printing September 1972'. Hard Cover. xii, 303 p. Among the essays are The Flowering and Subsequent Deflowering of New England; The Old Folks behind Home; A Clean, Well-Lighted Cellar; Taverns in the Town; West of the Bronx; Some Pirates and Lesser Men; The Leaping Corpse, the Shallow Cellar, the French Pastime, the Walking Radio, and Other Summer Mysteries. Dj slightly worn; VG. Stock#24535.